As many of you know, the opening reception for PREDRIVE: After Technology is just around the corner. With two weeks left, the show is coming together; artists are here working and pieces are coalescing. Would you like to help spread the word? If online guerilla marketing is your thing, below are two different sizes of embeddable PREDRIVE e-flyers. Feel free to copy and paste the corresponding HTML code onto your blog, myspace, or other social networking site. Or download one of the images and email it to your contact list. Anything you do is greatly appreciated. Happy e-flyering! Hey Hi. This is my first post here on the MF blog, so let me begin by introducing myself. My name is Lindsay and I handle membership for the museum, among other things. You can find out more about me HERE. As the first order of business in this, my first blog post, I'd like to acknowledge our most recent GREEN Member. Please join me in welcoming the Heavy Metal Farmer. 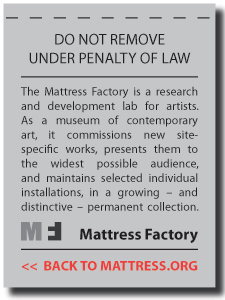 Did you know the Mattress Factory is the first museum in the U.S. to offer a GREEN, 100% paperless Membership level? We're really excited about it because there are a lot of great things about this membership. The first and most obvious benefit is on the environment. On average, MF members receive between 20-30 pieces of paper mail each year – from exhibition announcements and quarterly newsletters, to event invitations and written correspondence. Second, the GREEN Membership allows a greater percentage of your membership dollars to directly support the art, not the commercial printer or mailhouse. And last but not least, this membership level is designed to grow with emerging technologies. As developments are made, we're excited to move along with technological tide. You can find out more about the MF's GREEN Membership by CLICKING HERE. If you have any questions about MF Memberships, you can contact me directly at lindsay [at] mattress [dot] org. Thanks for reading! UPDATE (10/28/2008): This post is 100% true. I can confirm that the Heavy Metal Farmer (a.k.a. Davey Boyz) is really our most recent GREEN Member. He joined on October 27, 2008. Are you a blogger? Have you recently become Have you been intrigued with the immediacy and connectivity social networking sites like Twitter and Facebook provide since you were knee-high to a grasshopper? 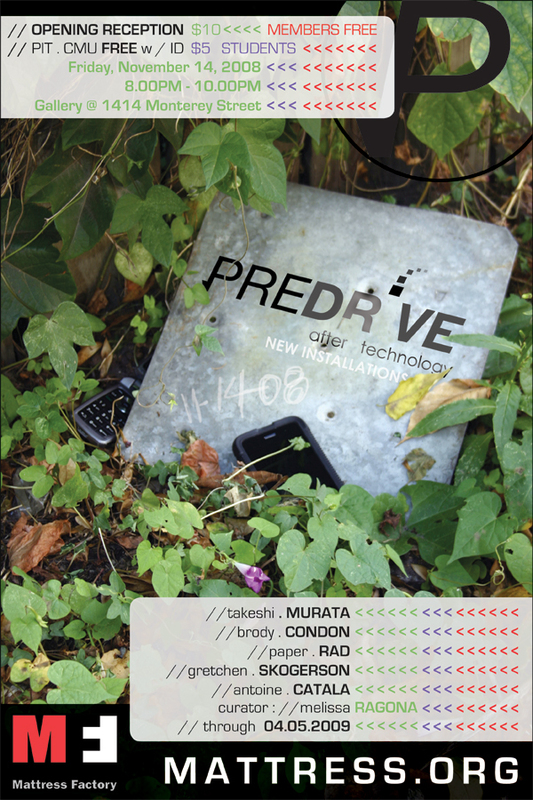 If so, you're invited to join us on Friday, November 14, for a social media meet-up at the Mattress Factory in conjunction with the opening reception for PREDRIVE: After Technology. How it works is simple. Register to attend by completing the form below. When you show up on 11/14, just give your name and we'll whisk you into the opening FREE (SAVE $10). We'll have beer & wine (ages 21+), hors d'oeuvres (sorry @mindbling, I had to Google the spelling, yet again!) and all the WiFi one can handle. Feel free to mingle with your fellow social media makers, live/photo blog the art, all the while Tweeting the evening's happenings. If you blog the show, we'll permalink the post here on the MF blog. Questions/recommendations/comments/et al? Contact me via email or Twitter. I hope to finally meet some of our "virtual" friends in-person. Our good friends at VisitPittsburgh invited six social media creators to town as part of last week's PodCamp Pittsburgh (#PCPGH3). Johnny Goldstein was one of them, and if his photo slideshow is any indication, it looks like he had a great time here. In a subsequent blog post, Johnny lists his favorite 24 things he stumbled across while in Pittsburgh. The MF is at #5. Not too shabby. Nate from the Pittsburgh Post-Gazette stopped by yesterday afternoon to shoot some footage of the Anniversary Art Auction preview for www.postgazette.com. As luck would have it, MF Co-Director Michael Olijnyk happened to be walking by. Michael was kind enough to spend a few minutes talking about the auction, delving deeper into the background of a few specific pieces. CLICK HERE to view the Post-Gazette video. CLICK HERE to view the complete auction catalog. 16 1/4" x 13 1/4" x 1/2"
Mixed Media; Pencil, water color on paper. From September 2006 through May 2008, artist Tom Sarver operated the Tom Museum in a nearby home on Sampsonia Way. The Tom Museum was both an irreverent commentary on the museum experience, and a view into the artist's creative process. Tom blends everyday activities and pastimes, such as cooking, fishing and gardening, with the arts of puppetry, painting and sculpture to engage visitors on many levels. His projects within the museum were inspired by everyday observations and experiences, including the weather, current events, and people he meets through visits, phone and e-mail. Visitors passing through the museum took part in a puppet shows, appeared on a talk show, enjoyed breakfast with the artist or critiqued his tomato plants. Audience interaction and feedback were encouraged. Tom Sarver is an artist driven by the philosophy of the artist as “inventor” or “pioneer” of new ways of thinking. His work spans a wide variety of mediums including painting, installation art, sculpture, video and performance art. 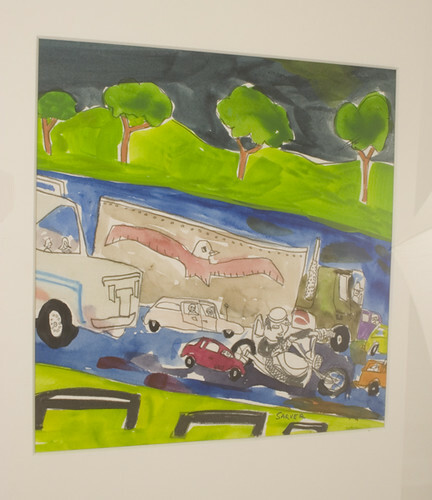 Sarver's work is characterized by low-tech gadgetry and the strong influence of Outsider Art or Art Brut. Sarver's work is also heavily influenced by puppetry. A self-taught puppeteer, Sarver has been performing in and organizing Pittsburgh's Black Sheep Puppet Festival since 1999. Political and social activism, common in grass roots puppetry across the county, has become prominent in his projects. Many of his paintings, installations and performances are centered on environmental or social issues. Sarah Oppenheimer opens apertures in existing architecture, modifying the recognizable modular units (such as rooms) that make up our standardized built world. Interested in the way that people navigate their environments through both familiar bodily experience and with the aid of navigational tools, like maps, Oppenheimer’s works alter the visitor’s experience and perception in the gallery space. Sarah is currently showing in the Mattress Factory's Inner and Outer Space exhibition. 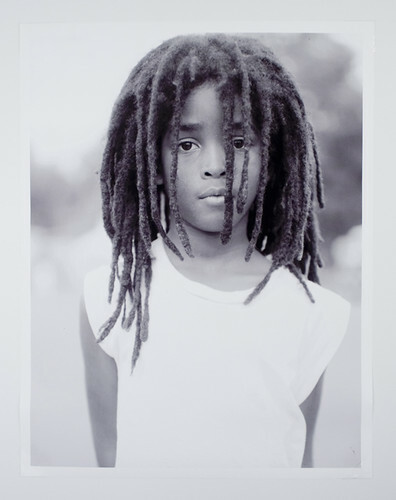 Her piece, 610-3356, has received positive criticism, specifically HERE and HERE. The titles of Oppenheimer's works are derived by reference to a typology or classification system created by the artist that describes, in graphic form, how the hole is perceptually perceived and the materials used to create it. 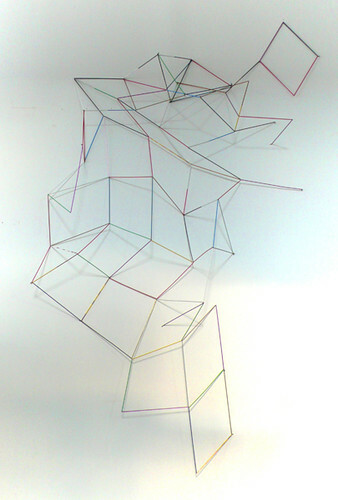 42" x 55" x 44"
Matchsticks, Glue, Wooden Frame, steel cable. 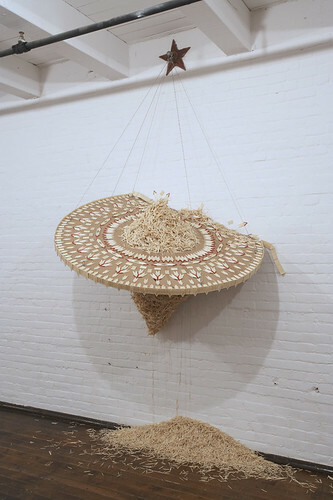 In Upadhyay's 2007 Mattress Factory installation Derelict, three sculptures made from matchsticks in the shapes of chandeliers were placed within the 4th floor space. One hung from a single wire, almost touching the floor. The second (and piece currently up for auction) appears to have been crushed against the wall. A third hung from the ceiling at the far end of the room. Hema Upadhyay on Derelict: "The crux of the work is that it comes from the idea of using materials that are flammable, literally. And everybody’s familiar with that.... People are like, 'ok this is a matchstick, and it’s a potent, flammable object. I want to use it in a destructive way.' A lot of these works stem from my own personal experiences in Mumbai and are a response to what is happening all over the world in terms of war." Hema Upadhyay on living and working in Pittsburgh: "In the city of Pittsburgh, and in my neighborhood here where I’m living, I have seen that a lot of homes are abandoned. It’s almost like somebody just left and wasn’t allowed to take their things. It kind of builds your own fantasy, and stories and myths about certain things and the objects from these homes. A chandelier has a connotation of wealth. In earlier days we may have thought that only rich people could afford chandeliers because they are made with crystals and semi-precious stones and things of that sort. In this piece there’s one chandelier crushed into the wall, so that it’s almost breaking apart. One is hanging very pretty and one is just on the floor. The silhouettes now read as people who were possessing these objecT...they become the shadow of the object." CONDITION REPORT: Hema Upadhyay created this matchstick sculpture on-location in the late summer of 2007 as part of the INDIA: New Installations, Part 2 exhibition that ran from 9/7/2007 through 1/20/2008. It has not left the MF facility since it was created, therefore the piece is in perfect condition. ARTIST BIO: Hema Upadhyay (b. 1972) received her BFA in Painting and her MFA in Printmaking both from the Faculty of Fine Arts, Baroda. Her work in mixed media and installation addresses issues of migration and displacement in India from her personal point of view while at the same time using Indian religious symbols such as the lotus or images from temple carvings. She won the Tenth Indian Triennial in 2001. She received the National Scholarship and the Gujarat State Award in 1996. She participated in a residency at Art Space in Sydney in 2001 and Vasl Residency in Karachi in 2003. She was included in Indian Summer at the École des Beaux Arts, Paris. Nicholas Forrest over at the Art Market Blog posted a nice article about our Anniversary Art Auction taking place THIS SATURDAY (!!!). While he showcases the James Turrell we have slated as LOT 82, he also mentions that bidders may find some hidden gems in the Margo Sawyer, Sarah Oppenheimer and Anita Dube pieces also up for auction. Monday through Friday of this week, I'll be posting a featured daily auction lot containing more detailed information about the artist, they're piece featured in the auction and they're time spent here at the museum. First up later today: Hema Upadhyay. David Ellis arrived at the Mattress Factory with a personal archive of collected papers and images and a Quonset-hut like structure in which to paint and be photographed. Essentially transporting the studio inside the Mattress Factory for his residency period, Ellis painted from morning to night inside the curved structure for 15 days in the museum’s lobby. Working in a tunnel of white light with a still camera pointed down from the ceiling, and producing a high-speed camera shoot over one weekend, the cameras captured the artist painting from a bird’s eye view perspective every few seconds. The only record of the continuous layering of paintings that he produced is this volume of digital images, now edited into an animated motion painting entitled OKAY. 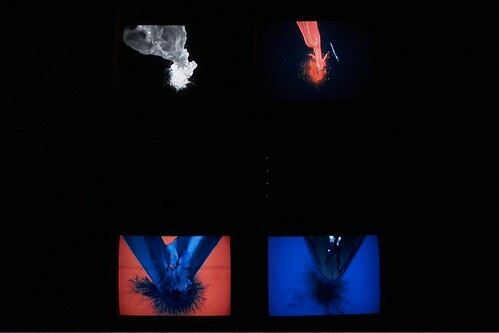 DROPTET is a four-part video installation. The title derives from a combination of the word “quartet” and “droplet.” Shot with a high-speed camera at 1000 frames per second, we see paint pouring from the camera in slow motion, bursting onto the floor and coming back at the viewer—a continuous flow. The work becomes a visual quartet. In FLY, to be shown on the CAPA High School electronic billboard in downtown Pittsburgh, the artist catapults into the frame, followed by a flow of paint. Skidding on his back across the wet floor, he leaves the frame, only to then return and elevate out of the visual space. For the paintings OH and US, the artist paints onto collaged pages comprised of the his to-do list and hardware store needs, papers from the daily grind, as well as things he finds on the street that might spark an idea for new work or trigger a memory. Ellis then responds to the pages by painting in and on them, rhythmically providing a pulse. The painted layer is graphic, loose and flowing. Ellis calls his signature painting form—a graphic wave in silver and black— “flow,” representing motion in air and water. There is an unconscious, visual catalog below the surface of the final work—an archaeological, archival underpinning inside the painting, submerged below grade. Those of you in the |STEEL| City who can stay out late on a school night should wander over to Club Café tonight at 10.00PM and check out the MF's very own Slim Cessna and the Auto Club. The MF crew will be representing in full-effect. 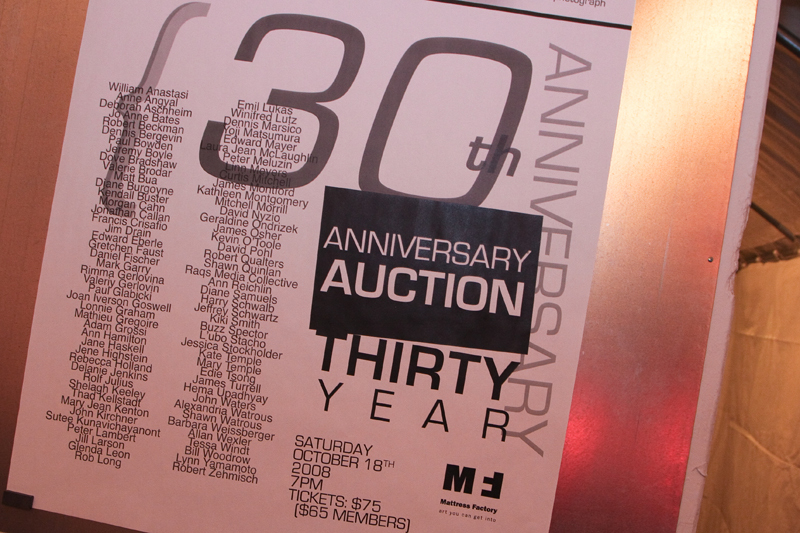 Below are some recent additions to the Anniversary Art Auction catalog. More information about the auction can be found HERE. View the complete catalog HERE. "Future Vitality", 2006, 20" x 62", Silver gelatin print, Diptych Edition 1 of 6. 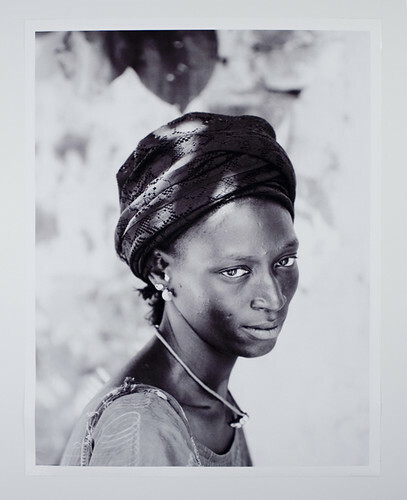 The artist exhibited in the museum's 2007 show featuring Indian art, "INDIA: New Installations, Part II"
"Adia, Goree Island, Senegal", n.d., 42" x 32", Digital print on paper. "Morning Visitor, Eatonville, Florida", n.d., 42" x 32", Digital print on paper. "Veil of Unknowing", 2005-2008, 12' x 5' x 10", Net of powder coated copper, brass, aluminum, and anodized aluminum, glass beads and fishing line. We're all very excited about a project that will be going live within the next few weeks. We can't talk openly about it now, but trust me. It's super cool. In order to get the word out to the good people in real-time, we will announce it via Twitter before anywhere else. Be the first on you block to get the news by following the MF on Twitter. What is Twitter? A nice introductory video from CurrentTV is below. 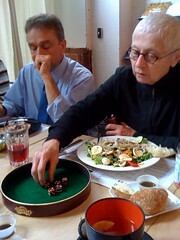 MF Co-Director Barbara Luderowski rolls the dice in the BoxSpring Café. As artists begin to arrive at the museum for their PREDRIVE: After Technology residencies, we'll be documenting the process along the way via real-time blog posts, Twitter Tweets, mobile photo posts and YouTube videos in an attempt to make the "behind the scenes" more transparent and accessible to you. Our documentation team, or iPosse as they've been dubbed, consists of several MF Staffers. iPosse profiles will be posted here in the next few days. 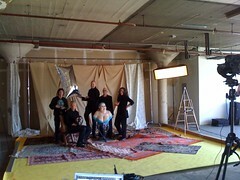 The first PREDRIVE artist, Gretchen Skogerson, arrives today. Work on her piece will begin relatively soon. Stay tuned.